This morning as I was get getting ready to leave for work, my front door suddenly slid open. It was my next-door neighbor. She was bringing over some SEKIHAN ( glutinous rice cooked with beans- something eaten on special occassions). It all happened so suddenly that I forgot to ask WHICH special event she had cooked it for. You see, as it turns out, this year two traditional events fall on the same day! There is SETSUBUN, the Bean Throwing Festival which is celebrated nationwide- and HATSU UMA, a special day which is quite obscure on a national scale but which has long been important in this part of Japan ( Ibaraki and Tochigi Prefectures). Since I have already written in detail about SETSUBUN, let me tell about this area`s unique way of celebrating HATU-UMA- which literally means the FIRST HORSE. If you look at a Japanese calendar, you will notice that every day of the month has been designated as belonging to a different animal of the Japanese zodiac. This coming Tuesday ( the 8th, on the Gregorian calendar), is the first Day of the Horse of the second month of the year, making it HATSU UMA (初午, the First Horse）, a day which has been celebrated for more than 1000 years by devotees of O-INARI-SAMA. There are tens of thousands of Inari shrines around Japan (more numerous than any other type of shrine), ranging from the grand to the tiny (these are called HOKORA, 祠), which are instantly recognizable by their red or vermilion torii gates (sometimes lined up one behind the other forming a tunnel!) 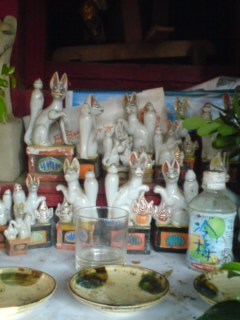 and their many fox statues and figurines which lead to the mistaken notion that the foxes are the Gods of these shrines. Even those who have never been to Japan have probably seen them in books or posters as these exotic features make them a very popular subject for photographers. The first Day of the Horse of the second month of the 4th year of WADO (711 AD) was the day on which the God UKANOMITAMA NO KAMI was called down to HIS/HER new home, Mt Inari (in modern day Kyoto), upon which later the Fushimi Inari Shrine would be built, as the Titular God (ujigami) of the great Hata Family, which had come to Japan from China. Ukanomitama No Mikoto was originally a god of food and rice. The alternate name INARI is actually a variation of INE NARI, which means to become rice (INE: 稲, rice; NARU: 成, to become, to grow). The fox, the messenger or servant of this god, has become so strongly associated with Inari shrines that these animals are often confused with the god him/herself. Over the years, as Inari shrines sprang up throughout the country, they became associated with other things besides agriculture, all in accordance with various stages of Japanese economic development: industry, business, sales, household safety, the arts, etc. 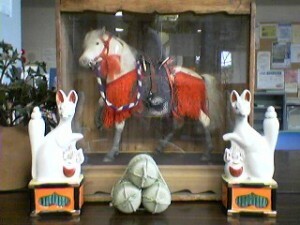 Inari is even considered the patron of mahjong parlors and tobacconists. Truly an all-purpose deity. In fact, the Fushimi Inari Shrine actually enshrined four other Gods besides Ukanomitama No Kami, which have become incorporated into the Inari of that shrine, though not necessarily all of the Inari shrines, especially the small ones, around Japan. 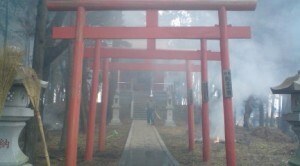 To celebrate the Inari’s original descent to Japan, devotees begin by cleaning the grounds around the Inari Shrines, as well as the shrine structures themselves. Today I chatted with the men who were getting ready for Hatsu Uma ceremonies at the Inari Shrine in Inarimae in Tsukuba, just across from Yu World and Cineplex. 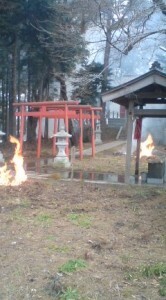 They were burning fallen leaves, cleaning the shrine building and preparing new sacred ornaments of straw, rope and paper, all in preparation for the ceremony which will be held at 10am on Tuesday ( February 8th). At homes, many families throughout Japan will be eating SEKI HAN (celebratory rice with red beans), and offering rice wine (o-miki), mochi, and seki han to the shrines along with plenty of ABURA AGE (fried tofu) which is supposedly a favorite food of foxes. Doing this is said to bring good harvests in the coming year and prevent disasters and sickness as well. Others believe that in this entrance examination period, PASSING THROUGH THE TORII GATE TUNNELS will help students PASS exams. An important belief associated with HATSU UMA is that it is a dangerous day on which to make a fire. Because of this superstition a very interesting and extremely localized custom has developed in parts of Ibaraki and Tochigi Prefectures. 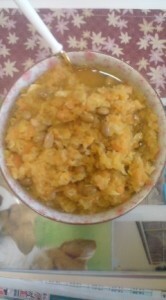 In order to avoid cooking with fire on this day, a special COLD DISH is made, which utilizes leftover beans from the setsubun bean throwing ceremony, the salted salmon which was eaten during New Year’s and the vegetables of the season- daikon radish and carrots, which is roughly grated with a bamboo grate called ONI OROSHI. Abura-age is also added in homage to the fox messengers. 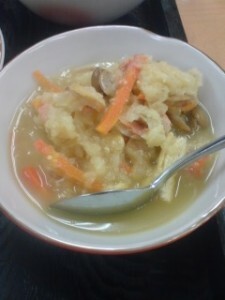 This special dish is known either as SUMITSUKARI or SUMITSUKARE, depending on the area. Sumitsukari and Celebration rice (sekihan) are also often wrapped in straw (separately) and offered to Inari Shrines and to the Household Gods ( Ujigami- Sama, 氏神様). Since this dish does not spoil easilly, what it is usually eaten by the family for a few days- anyway, until it is all finished. 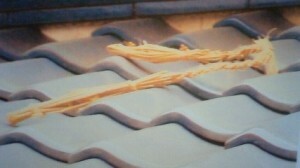 Also, in the belief that that it can help prevent fire, the sumitsukari and the rice, wrapped in their straw , are sometimes thrown over the roofs of houses. SUMITSUKARI appears to be experiencing a revival of sorts. I have met several women who have prepared this dish for this weeks celebrations, and there have even been classes in how to make it at community centers in this area. If you make it to the shrine in Inarimae on the morning of the 8th you might get a chance to taste this very unique dish. If you cant and are still interested, tell a local farmer that you`d lke to try some. Im sure they`d be happy to share with you. If you`d like to try and make it yourself here is the recipe. 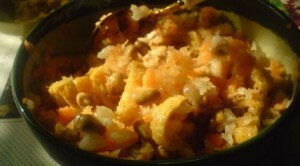 These recipes do not include salted salmon which is often used, especially in Tochigi. Ingredients :Half a daikon radish, half a carrot, half a cup of setsubun soy beans, a sheet of ABURA-AGE ( fried tofu), a tablespoon of Sake dregs, dashi (Japanese soup stock) to taste, and 2 tablespoons each of sugar, vinegar, and soy sauce. Roughly grate the radish and the carrot. Lightly grill or toast th abura-age, and chop up into thin pieces. Peel the soy beans after roasting a bit. Add to pot with therest of the ingredients and simmer. Same as the above, except lightly drain the liquid from the grated radish and carrot before adding the vinegar and sugar. The most famous Inari Shrines in Japan are the Fushimi Inari in Kyoto, the Kasama Inari in Ibaraki, and the Toyokawa Inari in Aichi. Even more interesting, however, are the small Inari Hokora you can find in Tsukuba’s bamboo groves and forests, or behind shops or restaurants. You can’t miss them with their red wooden gates and little fox figurines. Japan`s Eye-Grabbing HINA DOLLS (雛人形)- Coming Out of the Closet – in all their variety! I was able to get profound information about Hatsu-uma and Sumikatsuri!! The former one I just thought something vaguely related to horse of 12 zodiac cycle (my case horse). Latter I knew for the first time. I sometime considered myself I might be very close relation with fox, nobody could think me like fox, but rather resemble raccoon-dog. Even a sincere person like me in deep psychology, wish to have cunning cleverness of fox?? But I might have a few same DNA with fox. The reason is simple that I like grilled Aburaage (fried tofu) with a company of hot Sake more than anything. I think if my spouse allowed I would like to eat more than 15 sheets of grilled Aburaage with soy sauce and chopped long onion and naturally with a 900cc of Sake. Very near future I would like try to make Sumikatsuri by Avi-san’s recipe and taste with hot-sake. By this article I recognized for the first time how important of O- INARI-SAMA had been for Japanese because this god originally came from the god of rice production. Even the INARI(稲荷) was consisted from so familiar Chinese letters but I just missed INE(稲＝rice) letter. Consumption of rice by Japanese people has been decreasing; still our main dish is rice. (Per-capita-consumption 118kg in 1970, 61kg in 2006). I would like to warship much more O-INARI-SAMA!! We should prepare future worldwide food shortage because of increasing human population and unpredictable effect of climatic change. For Japanese food security domestic rice-production has been the most important and will be too. I could not forget hungry period after WWⅡ. I lived near Fushimi Inari Shrine. At that time, I didn’t know much about “Hatsuuma”. I didn’t go to Fushimi Inari Shrine on the “Hatsuuma” day. I feel regret about that now. I thought it was about the people of old waiting for spring. When we study about Setubun, Rissyunn,and Hatsuuma each, we discover that old ancient people thoughts were put into each event . I have never heard of “Sumitsukari”. I ‘m interested in this news. 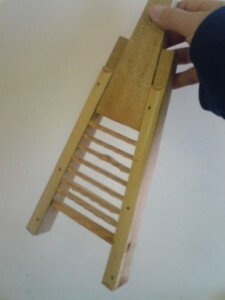 Today I am going to try to cook it using the materials at home in my own way. 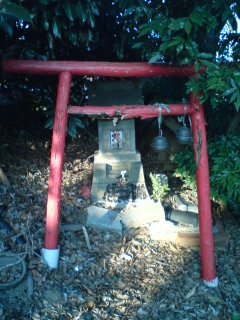 Thanks to you post, I now know that the shrine in the compound of a house nearby my place with two stone statues of the fox is Inari shrine. A private-owned shrine!